The last time Capcom released a Monster Hunter geared for the home console audience was back in 2009 with Monster Hunter Tri. Although the company has released some excellent games since, nothing has really matched the jump in scope that came from utilizing stronger hardware. That is, until now. 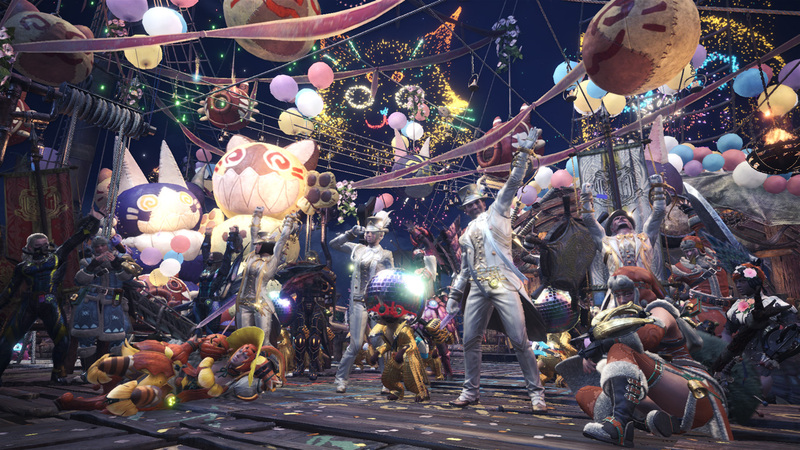 Monster Hunter: World re-invents and re-imagines many of the series' core tenets while also mainting the ideas that made earlier entries in the series great. If you're new to Monster Hunter, the name of the game is simple. Take one of 14 different weapon types, gear up, and head out into the world to hunt your prey. Then, you take the materials gathered from the world (primarily large monster parts carved from the corpses of those you slay) and use them to craft stronger weapons and armor to continue the cycle. That's your classic Monster Hunter loop. 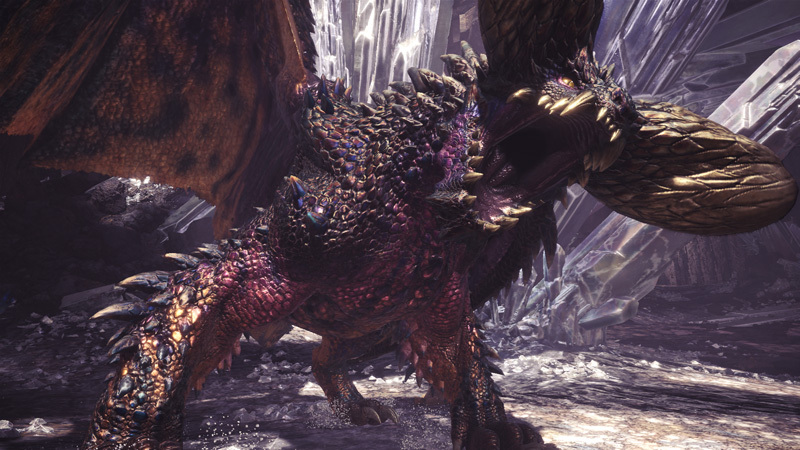 Monster Hunter's combat has always had a deliberate weight. Even with smaller, quicker weapons players are forced to consider their attacks lest they get countered by one of the game's fantastical beasts. Each weapon type has a certain degree of depth, and learning the ins and outs of them could probably be compared to learning a character's moveset in a fighting game. At any given time there's so much you can do, and part of the combat's allure is learning not only how to attack a monster, but also when. This idea even applies to things like healing. If you get hit in the middle of the animation for drinking a potion, only a portion of the potion's effect will be granted, wasting the rest of a resource-limited item. Whether attacking or fleeing the monster, players are forced to consider their surroundings. 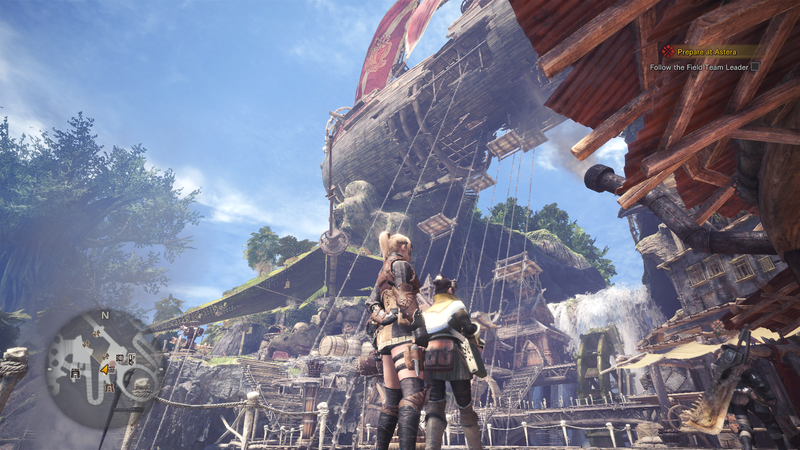 The first thing that will stand out to both longtime fans and newcomers alike is Monster Hunter: World's new emphasis on a seamless living, breathing world. Gone are the loading zones of past games, though areas are still split into specific segments marked on your map. Players now explore each of the game's locales seamlessly, taking advantage of all sorts of environmental features. Your new hub area of Astera grows and expands alongside you. Slide down a slope or drop down a hole to the bottom of the map, swing across gaps with vines or your grappling hook, maybe even hitch a ride on an unsuspecting wingdrake and have it take you across the map. 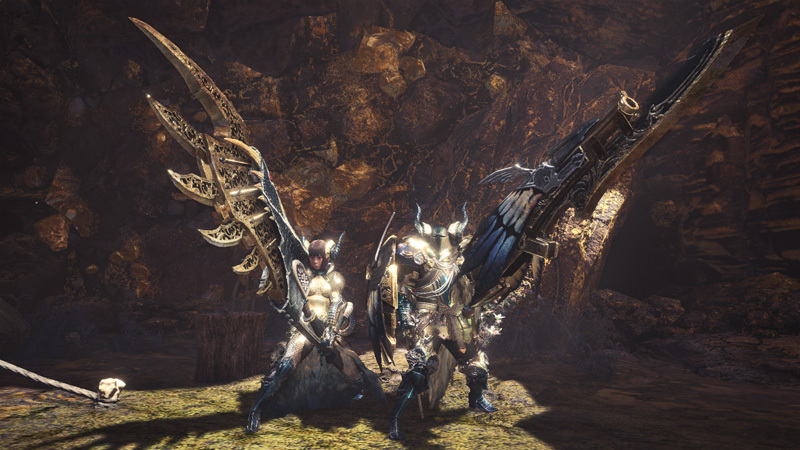 Vitally all of this feels pretty great, with traveling each of Monster Hunter World's unique zones as much a pleasure as hunting their inhabitants. As players progress through the game they can also find new areas to set up base camps in each biome, allowing for quick travel to distant corners of what are easily the largest maps the series has ever seen. It's not just the size of the maps that's different here, either. Maps have a much larger variety of gathering points then before, and a berth of living creatures to both capture as well as use to your advantage. Admittedly besides for a few specific creatures, the most use you'll get out of capturing animals is to set them as pets in your hunters room. 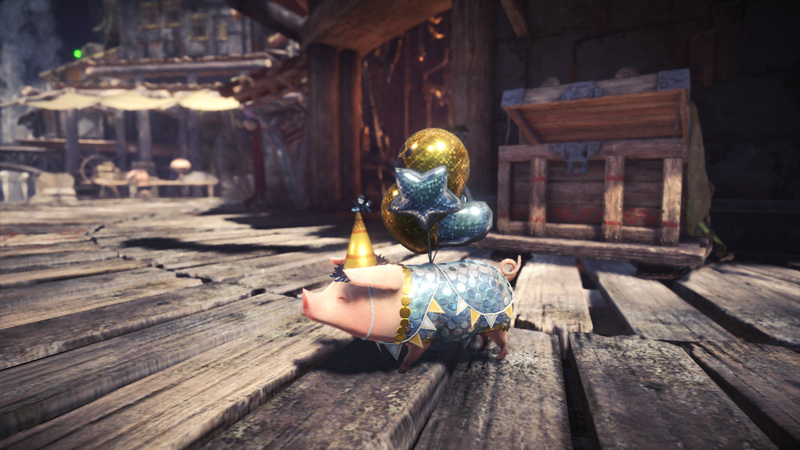 But even that is a joy, and that isn't to say that there isn't a whole lot you can do with the few creatures that can have a direct impact on a hunt - all part of this game's aim to have a living, breathing world where different elements of the world can interact in entertaining, surprising and often useful ways. 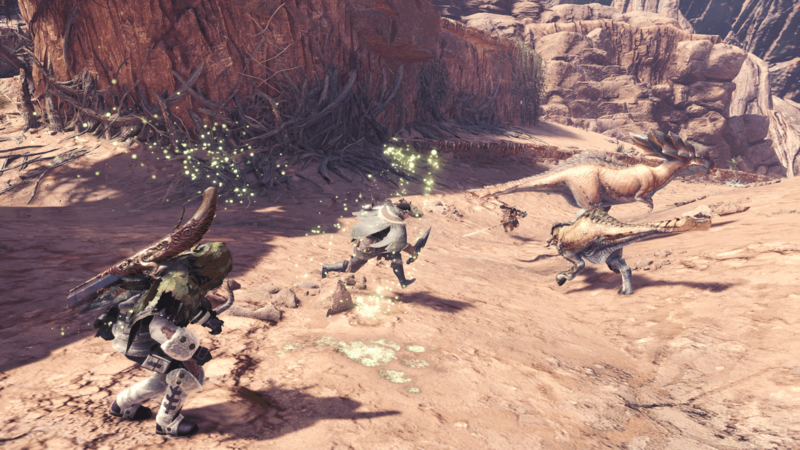 Toads can be kicked or hit to set off status ailments or explosions, for instance - but those explosions will impact your hunter too, so watch out! Flashbugs can be struck to potentially stun a monster, and even plant life like Poisoncups and Sporepuffs can be used in a variety of ways in the heat of the moment. Knowing your surroundings can have just as much impact as knowing a monster's various tells when it comes to making the most out of a hunt. There's a thrill to using the environment to turn a difficult encounter around, with the most satisfying environmental assist of all coming when you can force two monsters to turn on each other and take their eye off you for a moment. All of this wouldn't be possible without the jump that the series has made to home console - and the jump makes itself felt in visuals even more than in mechanics and systems. Monster Hunter World's realized maps are filled to the brim with details, and are naturally a major step up visually from prior generations on the 3DS and PSP. Quests can be tackled solo or in multiplayer, but there's a catch or two when it comes to grouping with friends. These zones are not just bigger, but also bolder and more dense with opportunity. Even taken in a vacuum, the game looks stunning, and the aforementioned abundance of plant and animal life gives each area a bustling, living feeling to them. 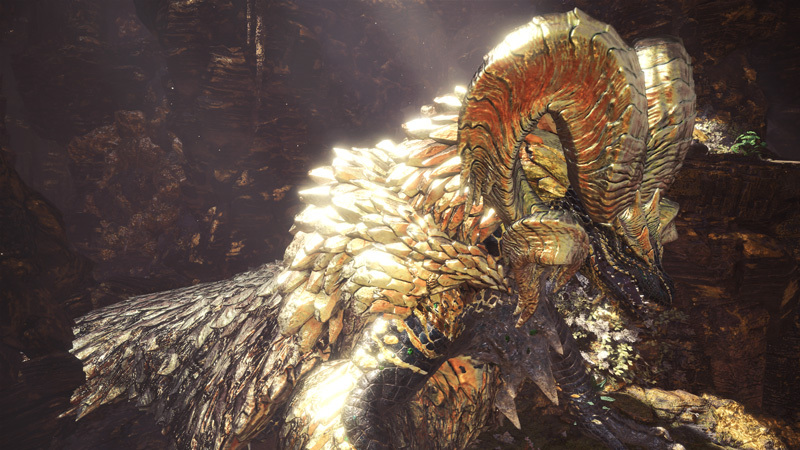 Your first time setting foot in the Coral Highlands will be breathtaking, but each of Monster Hunter: World's 5 main biomes are up there with my favorites from past titles. One concern I had coming into the game was how much content it would manage to pack in. Monster Hunter Tri, the last big visual jump for the series, was anemic on content, and while Monster Hunter 4 was better it was easy to see that a lot of assets were simply being re-used from the PSP. The game does decently in this regard; Monster Hunter World certainly doesn't have the largest roster of large monsters to fight in the series, but there's a lot to do and it's heavily bolstered by the previously mentioned density within each of its zones. 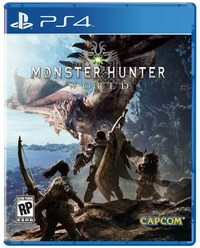 The solid mix of both old and new monsters on offer has managed to occupy me for 80 hours and counting, and the potential for online play and more sizable DLC also acts as a positive here. 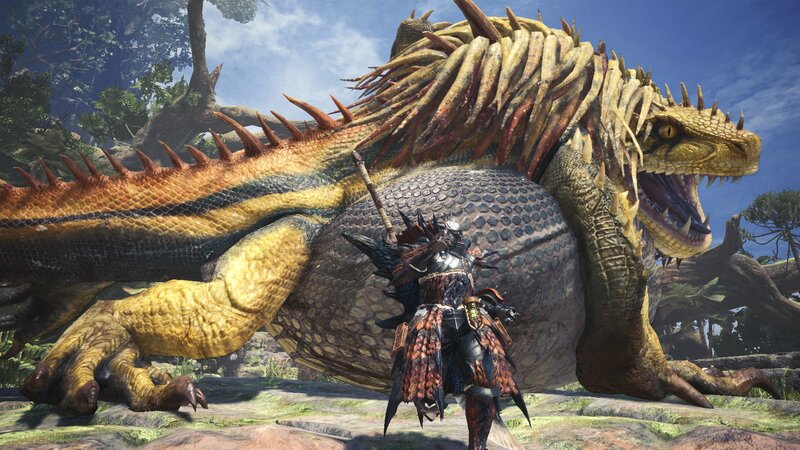 Fans might want to know that the now infamous "leaked monster list" appears to have been accurate, but players should expect a few more monsters besides Deviljho to release as DLC in the coming months. Another major addition for Monster Hunter World and point of concern for me was the much-touted ability to play any quest via drop-in, drop-out multiplayer. This promise from Capcom does ultimately pan out, but the full story here is a little more complicated than one might initially be led to believe. 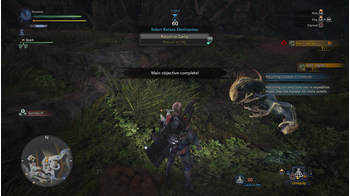 Players can indeed hook up with friends for every quest in the game, but there's a big catch when it comes to the main story missions, the 'Assigned Quests'. Namely, players can't band together in these quests until they've already viewed the cutscenes that are in that quest apart from ones that play after the quest is cleared. Essentially it works like this: if a mission has a cutscene at the start and then another before the story monster target is introduced, you won't be able to invite friends until you've seen both those scenes - and they won't be able to join until you've done the same. In order to progress through the story as a 4 person group, each player must individually view the cutscenes in their story mission, back out, and then reband as a group to clear the quest. Alternatively, if only one person hasn't already cleared the quest, than that person can send out an SOS Flare to call for help after they're notified that the option has become availabe mid-hunt, once the cutscenes are done. It's a convoluted setup, and it's one that despite the ease of online invites I can't help but feel is a step back from prior titles. This decision has been made in the name of story, and the narrative Monster Hunter World tells is serviceable. It should be enough to keep players that absolutely need a story in their games engaged, but there's nothing that'll blow your mind here - one can sense that this narrative exists to tick a box and attract a new crowd of players who found Monster Hunter too story-light before. I can only hope Capcom figure out some better solution to online play for a patch in the near future, because as it stands this is the one glaring issue in an otherwise fantastic game. Though these things are important, they're ultimately nitpicks. 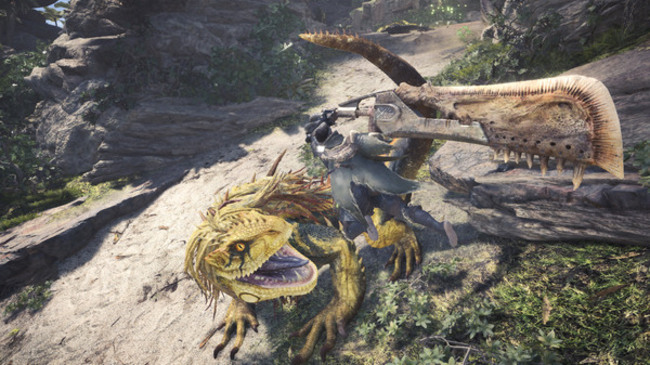 When you dig down to the heart of Monster Hunter: World what you'll find is quite possibly the best entry in the franchise, a game that strikes an excellent balance between making the series more paletable to a wider audience without damaging the elements that made the series so dear to its dedicated fanbase to begin with. It's an explosive start to 2018, and I'm very excited for the game's content updates in the future.